Merry Christmas and Happy Holidays To Our Troops, Veterans, and their Families. During this Christmas season we want to thank our veterans and soldiers for their bravery and selfless acts of courage in defending us and preserving our Nation's freedom. Again this year soldiers will observe the holiday season in Iraq and Afghanistan. They are separated from their families, and many more are preparing for deployments. All of us who remember similar Christmas seasons in our own lives sympathize deeply with them. 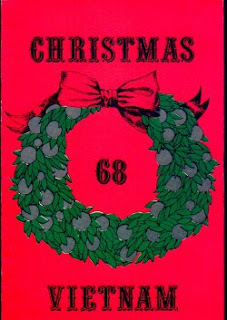 To the right is the cover from the 1968 Christmas card sent home from Vietnam. Forty years ago we spent Christmas Eve and Christmas Day in platoon blocking positions near Nu Ba Den Mt. It was a lonely time for us then as it is for our soldiers today. As we think of our Christmas so long ago away from home these sacrifices are most obvious to us during this season when so many of us are warm, safe and happy in our homes with friends and relatives. Our thoughts and prayers are for the safe return of our soldiers not only during this holiday season but every day throughout the year. We honor their sacrifices, ask God to watch over them and their families, and pray for their safe return. Bob Dandridge has this suggestion to help support our servicemen and women who are traveling this holiday season. If you happen to be driving by an airport anytime soon, remember your troops and the USO. If you have books and magazines pack'm up, stop by the store and pick up some packaged snacks and drinks and drop them off at the USO booth/room at the airport. All you ex GIs remember how lonely travel was. You can make it a little more pleasant. I've done it a couple of times and it feels great. Our men and women in uniform deserve our support and this is one of the little ways you can do it with a personal touch. Merry Christmas and Happy New Year from Bob. Great idea Bob and thanks for providing it.